With the advance of the Libyan National Army on Tripoli, the chaos of the post-Qaddafi era looks set to continue. As foreign interests continue to play a major role in the country, Khalifa Haftar is an unlikely saviour for the troubled state. There was intense excitement in Libya in 2011 with the removal of Muammar Qaddafi and the holding of democratic elections. Since then the dream has turned to a nightmare with squabbling elites, ineffectual governance, the dominance of armed militias and involvement of foreign countries pursuing their own interests at the expense of ordinary Libyans. The crisis has entered a new phase with the advance of the Libyan National Army (LNA) towards Tripoli (Operation Flood of Dignity). Led by “Field Marshal” Khalifa Haftar, the LNA is advancing from its stronghold in Benghazi in eastern Libya towards the capital, which is controlled by the United Nations (UN)-supported Government of National Accord. 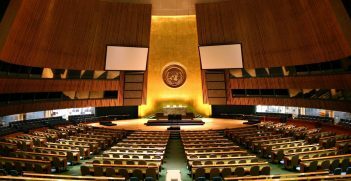 Libya has been struggling with an ineffectual governance structure developed under UN auspices in 2015, with an elected House of Representatives based in Benghazi and a Presidential Council in Tripoli. The two bodies refuse to recognise each other and pursue conflicting policies. While the Presidential Council is meant to control the LNA, the House of Representatives appointed Haftar as its commander, giving him an element of legitimacy. Despite its UN endorsement and the public support of the international community, the government in Tripoli is weak. It has failed to consolidate the institutions of the state, presiding over corruption, a declining economy and social services and is reliant on various militias based in western Libya. Some of these militias have seized positions in key government institutions such as the central bank. Haftar’s action should not come as a surprise. Since January, he has been expanding the areas under his control, including oil-producing regions in the south. He has also declared his determination to control any electoral process that might be agreed. Under the guidance of UN Special Envoy to Libya Ghassan Salamé, there was to be a conference in mid-April involving the various competing forces in Libya to prepare for elections later in the year. Haftar launched his attack on the same day that UN Secretary-General Antonio Guterres was in Tripoli to promote the process. The conference has now been postponed indefinitely. 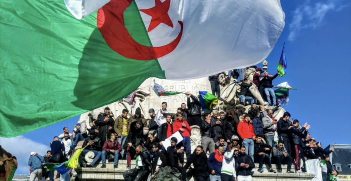 Haftar had been constrained by the Algerian government, which is determined to prevent Salafist forces associated with Haftar from gaining a foothold in North Africa. The political unrest in Algeria has distracted the government and given Haftar an opportunity to act. 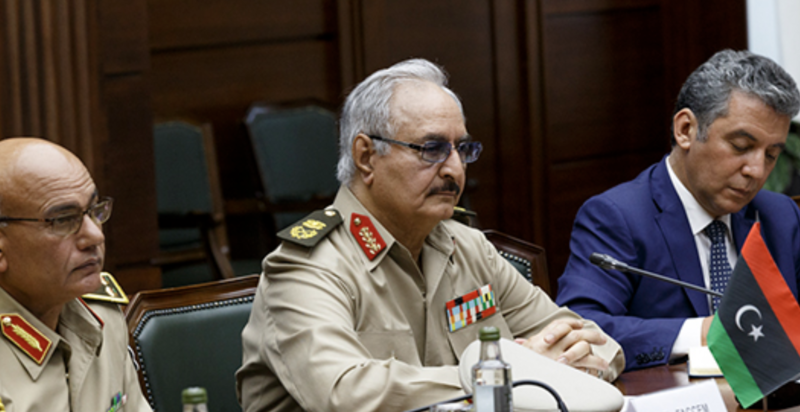 Haftar is, above all, a pragmatist intent on political power. He was a member of Muammar Qaddafi’s Revolutionary Command Council, which overthrew the monarchy in 1969. He led Libyan forces attempting to gain a foothold in Chad during the 1980s and was captured during the fighting. As a result, he was disowned by Qaddafi and sought refuge in the United States where he became an American citizen. Haftar returned to Libya in 2011 and set himself the task of ridding the country of Islamist forces. He succeeded in Benghazi in the east and now declares his intention to rid the entire country of Islamists and terrorists. Haftar appears to have little concern for the niceties of democracy and human rights, modelling himself on the Egyptian dictator Abdel Fattah Al-Sisi. Despite having agreed in February to support UN-sponsored elections this year, Haftar has threatened to seize power if the election result is not to his liking. Haftar benefits from a range of external supporters. Europe is ambivalent about him with France providing discreet support, much to Italy’s disquiet. 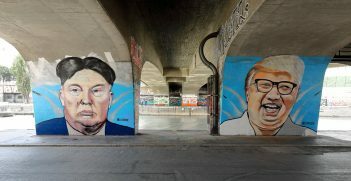 The Europeans see Libya as an increasingly important source of oil as a result of US sanctions on Iran and some European leaders see Haftar as the man who can get the Libyan oil sector moving again. They also recognise Libya’s central role in efforts to control the flow of people from Africa to Europe. His most important supporters are Saudi Arabia, Egypt and, especially, the United Arab Emirates. These countries have been providing significant military and financial support with a view to snuffing out any revival of the democratic impulse released in 2011 and challenging alleged activities of Islamist groups, including the Muslim Brotherhood and its backer, Qatar. The Saudis would also like to promote their Salafist interpretation of Islam in North Africa, while the Emiratis see Libya as part of their grand plan of presenting themselves as a major force in the region. The Emiratis have established a presence at an airfield in eastern Libya and their air force has been involved in attacking anti-Haftar targets. It is not yet clear how far Haftar is willing or able to push his advance. He is not popular in the west of the country and capturing Tripoli could prove to be beyond him. Instead, he may be intent on sending a warning to the UN of the need to exclude militias and to give him a central role in any future political arrangement for the country. Regardless, fighting has reached the outskirts of the city where a coalition of militia groups is attempting to drive Haftar’s forces back. The fighting has displaced several thousand people and has put at risk the many thousands of African refugees and migrants held in camps across the city. Mr Salamé, the UN representative, has sought to involve all relevant parties in a political solution to Libya’s troubles. A problem for Salamé, however, is that many of the Libyan groups on both sides of the conflict have dubious motivations, being either extremist or criminal in their orientation. Moreover, while the European Union foreign policy head, Federica Mogherini, claims Europe is united in its desire to see an end to the fighting and its support for UN action, the Europeans would probably settle for any stable government that could keep the oil pipelines open, whether it is the Presidential Council in Tripoli or the House of Representatives in Benghazi. For their part, the Arab triumvirate may be more intent on maintaining the turmoil in pursuit of their own aims. The crisis that began in 2011 with the casually ill-prepared removal of Qaddafi has persisted, in part, because of the indifference of Europe and the United States, an indifference in which Western media are complicit. Responses to the fighting have been ineffectual or even ambiguous. Indeed, the Europeans may calculate that the status quo might make Libya a more accommodating partner in dealing with the refugee-migrant crisis than a unified entity. It is important that firm action is taken to stop the fighting from spreading, lest it draws the various foreign powers into a more direct role. Until the international community makes a clear and firm commitment to a settlement in Libya there would seem to be little prospect of an end to the suffering of the people of Libya. Dr Anthony Billingsley is an adjunct senior lecturer in the School of Social Sciences at the University of NSW. His research focus is on Middle East politics and on the politics of international law.